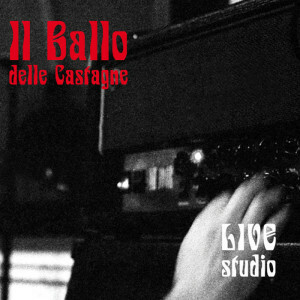 Il Ballo Delle Cassagne is considered part of the Rock Progressivo Italiano (RPI) movement within progressive rock, but is more fittingly described as Dark Italian Prog. Unlike most RPI bands, they don’t copy the sound of the progressive rock acts that Italy brougth forth in the 1970s (PFM, Banco del Mutuo Soccorso, Le Orme, Museo Rosenbach), but rather create their own mix of styles. As a result, this album contains a mix of Italian prog, krautrock, space rock and even a little bit of jazz influences, creating a foundation for the dark, mysterious vocals of Vinz Aquarias and guest vocalist Marina Larcher. Her chants add a druidic feel to some of the tracks, lie Tema di Gilgamesh and Il Viaggio. Musically, the album is varied, with a solid rhythm section (Diego Ranchero does seem to have some jazz background in his playing, just listen to Il Trema), space rock like guitars and enough from for some good old fashioned organ playing. The album, which is released as a limited edition CD (108 hand numbered copies and a few also hand marked promo copies) contains three covers of the band’s own idols. The most interesting one for me was their rendition of Appearance of the Voice by Eloy. The track’s lyrics were replaced by Italian lyrics, and Vinz really shines on this one. Next to this, the covers are Areknames by Italian Franco Battioto and Fire in the Sky, by Ya Ho Wa 13. Both bands I don’t know, but the way Il Ballo Delle Cassagne plays their works makes that they are now added to my list of acts to check out further, together with Il Ballo themselves. The darkness of the bands sound may not be something one wants to hear on a daily basis, but at the right time and in the right place this is certainly worth listening – and listening attentively as well. Recommended!